Lot:5032 Lot of (2) Friedberg Unlisted (W-Unlisted). Act of July 17, 1861 (1862) $10 Interest Bearing Notes. Lot of (2) Friedberg Unlisted (W-Unlisted). 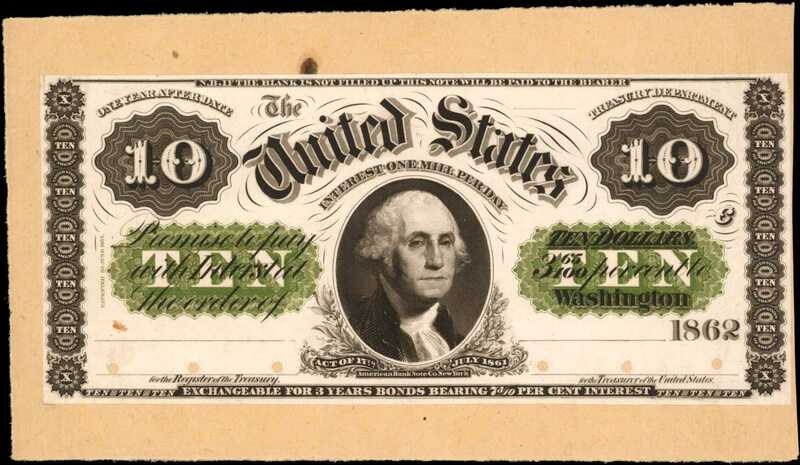 Act of July 17, 1861 (1862) $10 Interest Bearing Notes. PCGS Currency Choice New 63 and PMG Gem Uncirculated 65 EPQ. Face and Back Proofs.Hessler-ITE4 & 4a. India paper mounted to card. Plate C. Central portrait vignette of Washington. 10 die counters at upper left and right with outlined TEN protectors in green below. Extremely similar styling to the 1862 Legal Tender series for which these were used as a basis of style. INTEREST ONE MIL PER DAY arched above portrait and Act of 17th, July 1861 in ribbons below. A very important pair that is a key impression in any advanced federal proof cabinet. A similar (if not the same pair) sold in a 1991 Christies sale with both face and back.Heritage Currency Auctions sale of April 29, 2011, lots 16748 and 16749.